I have a very sweet tooth and one of the mainstays in my pantry is a jar of raw honey, not the pasteurized stuff, but raw honey straight from the comb and barely sieved to remove bits of wax. There’s just something about the thick golden-yellow liquid that is so appealing. It’s versatile for flavouring both sweets and meats, it has a number of health benefits and it’s delicious. Little Odd Forest prints, one of our favourite online designers, has recently released an adorable earring collection inspired by honey, the creatures that make it and the creatures that eat it. Naturally, I ordered the entire honey-inspired collection for my personal wardrobe. 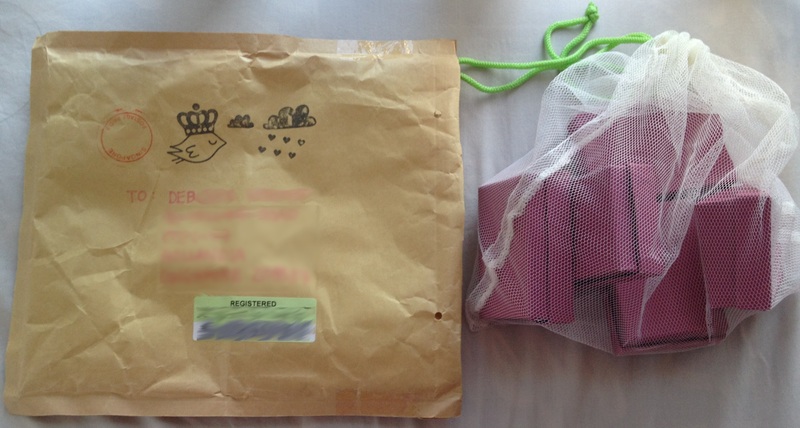 They arrived in a timely manner in the most adorable envelope ever. The postal bird bringeth the presents! But the envelope wasn’t where the surprises ended. Little Odd Forest included a small netting bag for the collection, handy for keeping the collection together and but also useful for other things (like laundry). 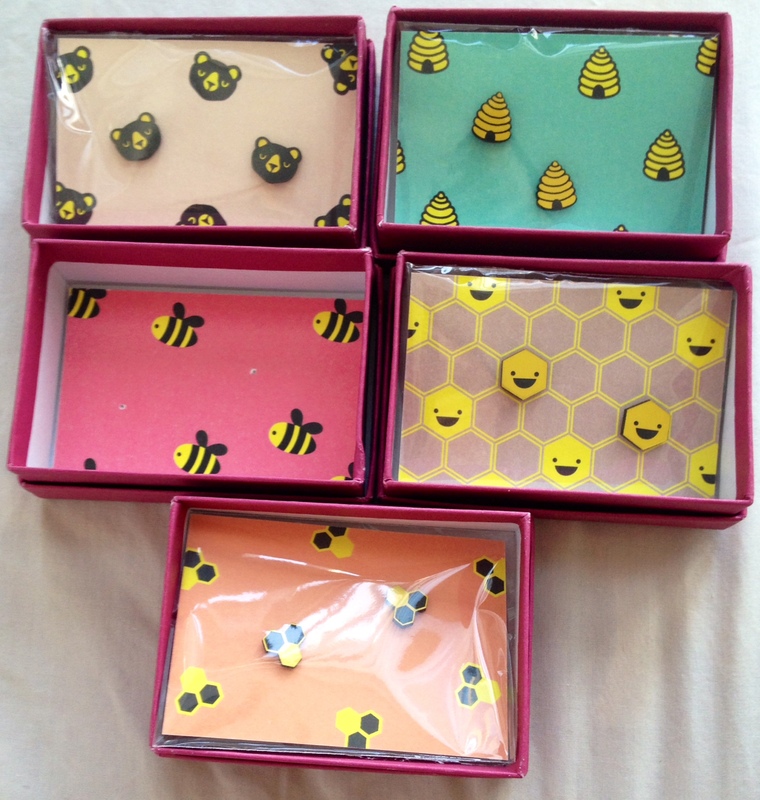 Inside, I found 6 pairs of the most adorable earrings, packed neatly in little boxes. 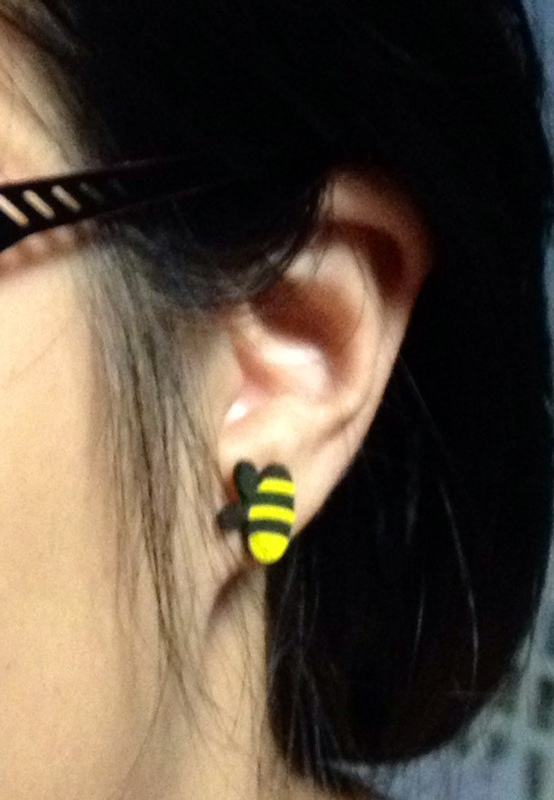 If you’re wondering where the bee earrings were, I couldn’t help myself and had popped them on almost immediately after opening the packages. They’ve been a real hit at the workplace. The earrings are made out of laser cut plastic and stainless steel. I’m really impressed with the adorableness of the designs! You can get Little Odd Forest bags at Sandy Designs at Shop 483, King St in Sydney’s Newtown. I’ve been given to understand that their bags are both adorable and fairly durable (as my sister carries one practically everywhere). If you’re looking for the earrings specifically, you can buy them at Little Odd Forest’s website, which ships internationally. 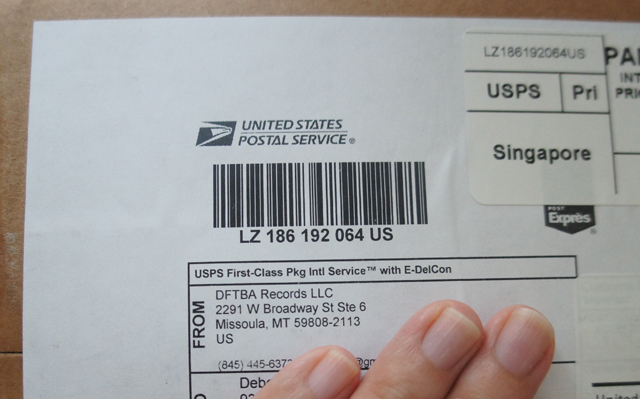 From Missoula to Singapore, a package from DFTBA records! Hurrah hurrah! I have been waiting SO LONG for this and it’s finally here! 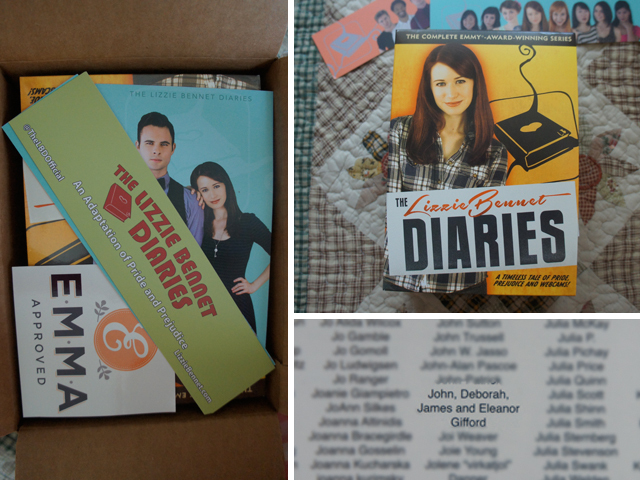 A little bit of background: last year, I backed the Lizzie Bennet Diaries Kickstarter Campaign, and I’ve been waiting to receive the DVDs for nearly half a year! The Lizzie Bennet Diaries is a webseries based on Jane Austen’s Pride and Prejudice, and it is really awesome! What made it super special was that the webseries was interactive, and covered several social media platforms including Twitter and Tumblr! I was especially impressed with the portrayal of Lydia Bennet (beautifully done by Mary Kate Wiles), which I felt was really different from all the silly and frivolous Lydias in other television and movie adaptations that I’ve seen…and I think it’s really cool that Jane Bennet (known in the real world as Laura Spencer) has gone on to mainstream TV! 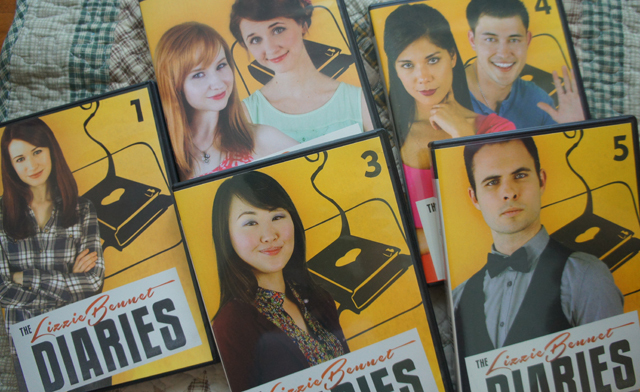 You can view the complete (Emmy award winning) series online at The Lizzie Bennet Diaries Youtube channel. 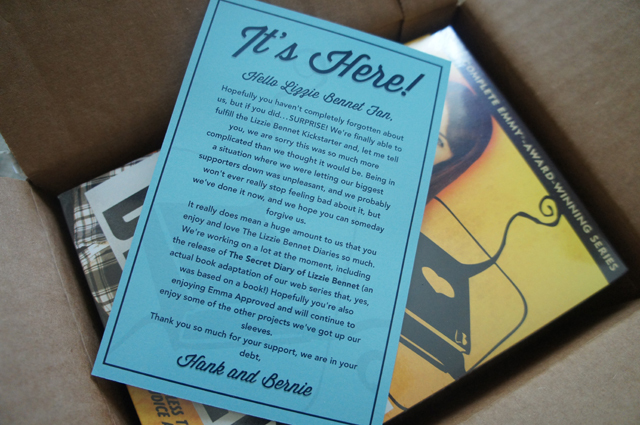 Apart from being one of the first to get my mitts on the DVDs, as Kickstarter backers, our names are printed in the DVD liner For All Time, and as an extra something something, the cool folk at DFTBA Records threw in a couple of stickers and bookmarks in the box! Thanks guys! I cannot wait to watch all the episodes again, as well as all the extra behind-the-scenes stuff! I can sense a video marathon about to happen. I am proud to have been part of this Kickstarter so that Pemberley Digital can continue to tell great stories! Thank you Hank Green for having the vision to make this happen! Let’s catch a star together! 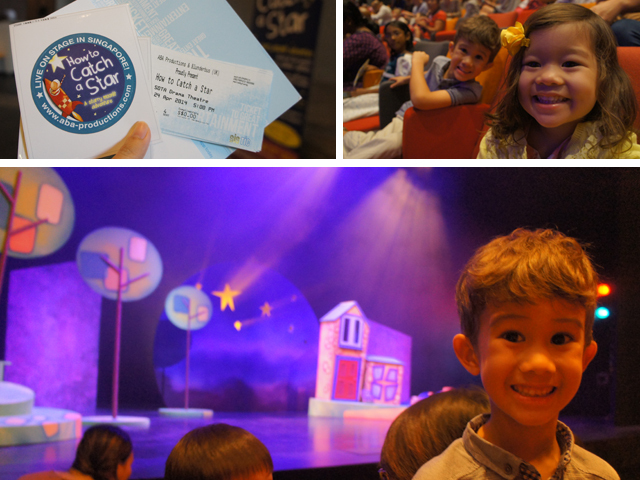 We were invited to the opening performance of ‘How to Catch A Star‘ yesterday, performed by the Blunderbus Theatre Company from the UK – and it was bundle of fun from start to finish! The fun started as we were all getting seated in the theatre before the start of the show. The cast members were already mingling with the kids in the audience, charming each one and learning their names in order to give them a special starry moment by calling out to them during the performance. Imagine J’s delight when Boy pointed towards him during the show and called him a ‘Lucky Star’! J’s big beaming smile was priceless! 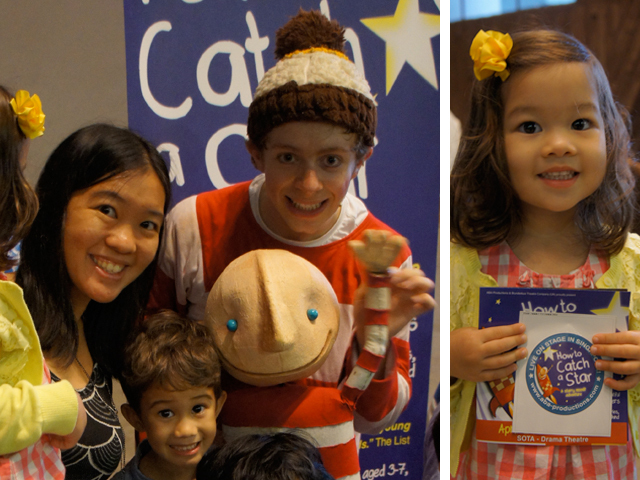 Both J and Little E were absolutely captivated by the adventures of Boy (played by Ben Sbuttoni) and the Invisible Starkeepers, Ariel and Aurora, (played by Emma Hilts and Katie Burchett), as they traipsed across the sea, land, and even outer space on a quest to find a starry friend. Ben, Emma (who plays the ukulele during the show) and Katie (with her clarinet) had us all giggling with delight with their fun antics and expressive vocal sound effects, adding life to the storytelling which was accomplished using vibrantly coloured Oliver Jeffers-inspired props and puppets. You can really tell from their physicality and energy that the cast members have a real enthusiasm for bringing the magic of theatre to children! (Read my interview with lead actor Ben Sbuttoni here). After the show, the cast members met us all outside for a very quick meet-and-greet…and all the children received stickers and balloons to bring home. What a wonderful end to a really magical afternoon! ‘How to Catch a Star’ will be showing from 24-27 April 2014 at the SOTA (School of The Arts) Drama Theatre and tickets are available at Sistic. There are still plenty of tickets left, but I hear that they are selling out pretty fast – so grab yours quick before they are all gone! In Singapore, bilingualism is a skill that is encouraged in schools, and it is compulsory for all children to choose a second language (English being considered a first language here) that is related to their roots. Both J and Little E have chinese roots, and are learning mandarin in school. 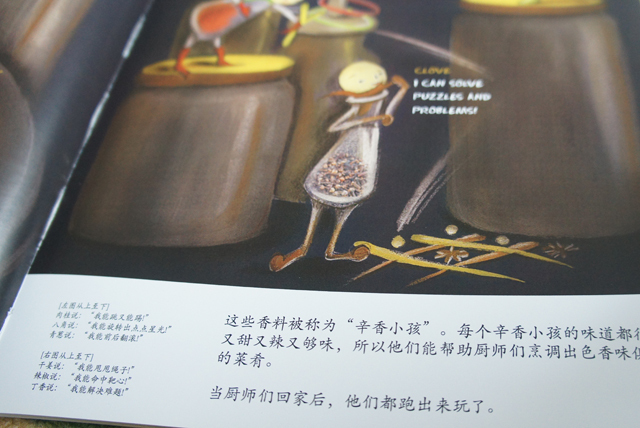 Unfortunately, my own knowledge of mandarin is highly limited, but I do try my best to expose my children to the language as much as possible by reading mandarin storybooks to them. When Linn Shekinah got in touch with me to ask if I would like to review one of her books, I felt that it would be a wonderful opportunity to not only support a local author, but also introduce a new book series to J and Little E to spark their interest in mandarin. 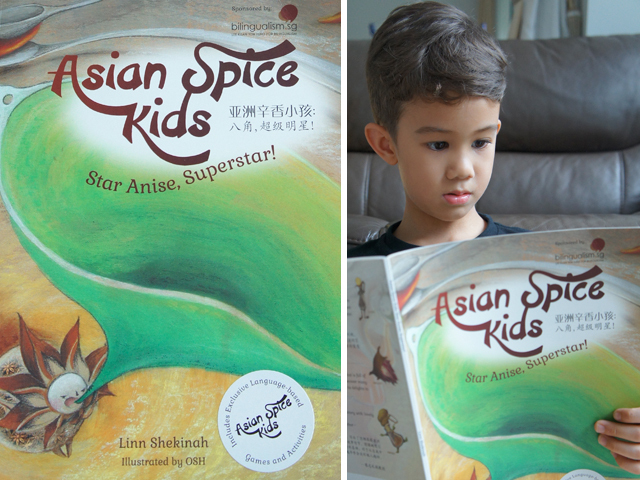 Star Anise, Superstar is the first book in the series, and it is also the first bilingual picture book that Ms Shekinah has published with the support of MOE’s Lee Kuan Yew Bilingualism Fund. This book is available in both English-Chinese and English-Malay versions, and we opted for the English-Chinese version. The story itself is straightforward, and emphasises the importance of family loyalty and togetherness over self-aggrandisement. As an emerging reader, J was able to read the story to himself rather well. I do like the illustrations which have a very nice local flavour to them. 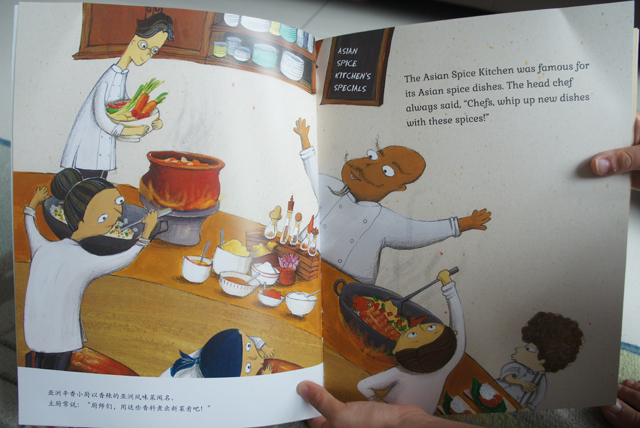 I love the idea of using asian spices (such as star anise, cloves, shallot, cinnamon, ginger and chilli) as a focal point in the book, with each spice representing a different aspect of creative expression. This opens up a whole world of discovery for kids and is a great way to encourage them to explore the culinary world! The book itself comes with a game and suggested activities in a pull-out sheet and there are some free printables that you can download from the related website, but if you really want to create a multi-sensory learning journey, here are some brilliant ideas from Mum in the Making. I wish I could read it! Judging from the size of the chinese characters in the story, it is clear that this is more of a ‘read-to-your-preschooler’ book, and although the book came with a glossary of chinese vocabulary words and phrases at the back, I was utterly unable to read the story to my children in mandarin – basically because my mandarin skills are far, far beneath the level of the book. I would have really appreciated some hanyu pinyin (the official phonetic transcription) to help me along, or even an audiobook version…but maybe I can convince L from Little Blue Bottle to read it to me! If you would like a copy of Star Anise, Superstar – it’s available at all major bookstores as well as online at Flip For Joy. Last week, Little E went to the kitchens of a local Italian restaurant (who does not wish to be named), in order to learn the secrets behind their tasty, tasty pizzas. It’s so much fun to play with food! I mean, why play with playdoh, when you can play with real dough that you can actually eat? P.S. Watch our first episode of Playing with Food here. edit: You may have noticed that I have edited the content of this post as well as the accompanying video since I first posted it! This is at the request of the Restaurant-who-shall-not-be-named. Easter is just round the corner! If you are scrambling around for some last minute Easter or Spring-themed projects, or you are planning to throw an Easter Egg hunt and are looking for ideas, here is one simple egg decorating craft for you which can be done with your preschoolers (or kids and grownups of any age!). 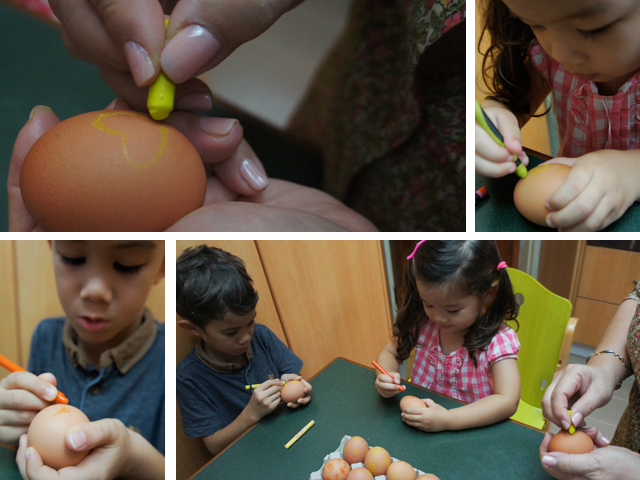 First, colour patterns or draw pictures over cool boiled eggs using wax crayons. Pick bright or light colours like yellow, orange, pale green and pink. 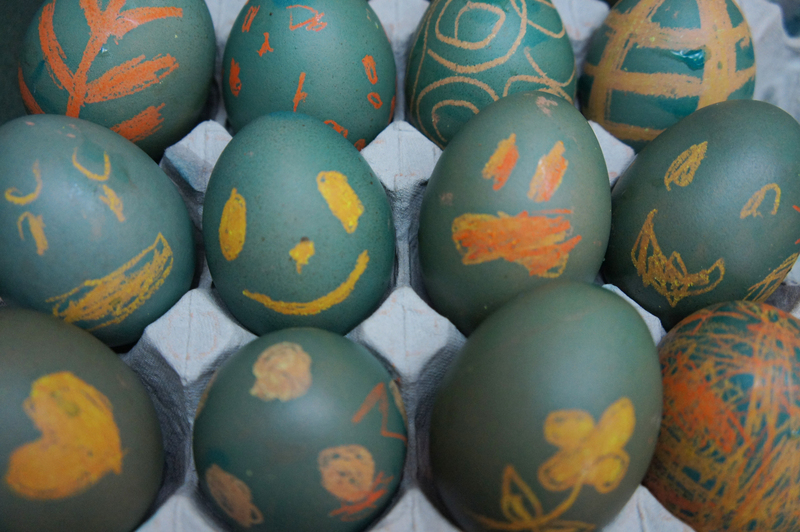 Younger kids can just scribble lightly over the eggshell. If you use brown eggs (which is what we did), don’t be worried if you cannot see the patterns right away – they will show up later, as you will soon see. 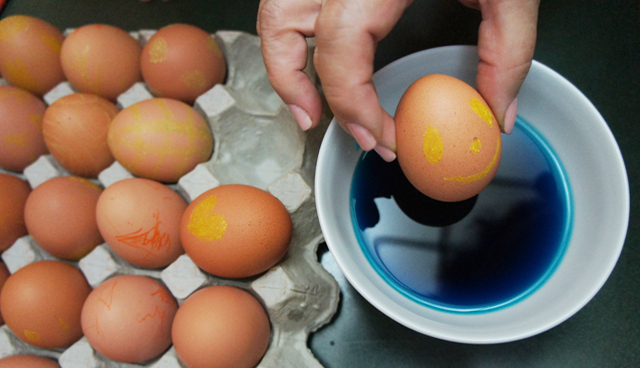 Prepare the egg dye in a deep bowl. We used 1 cup of plain water and a 1/4 cup of plain white vinegar, along with half a teaspoon of liquid blue food colouring. I chose blue because it would contrast with the yellow and orange crayons that we used. Using a spoon, we dropped each egg into the bowl until they were the desired colour. The longer you soak the eggs, deeper the resulting colour will be and the more brightly your wax design will show up. 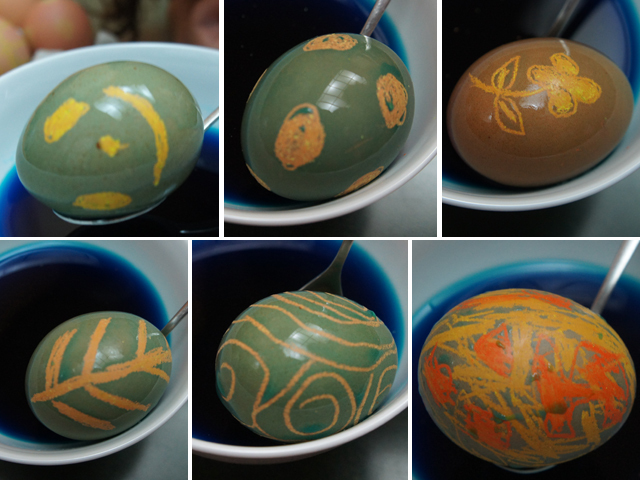 We used a long handled spoon to rotate the eggs in the dye to give it an even colour. Don’t be afraid to put the eggs in the dye for a second round if the colour isn’t deep enough. We used brown eggs, so each one came out a slightly different shade of turquoise, but if you use white eggs, the colour will be more even. Experiment with different patterns and let your imagination be your guide! J and Little E really liked how the food dye made their patterns appear as if by magic! J made a few eggs inspired by the Lego Movie’s Good Cop-Bad Cop character, whilst Little E was much more abstract in her designs. If you need some more ideas, here are my 15 favourites from around the web! These are all kid-friendly projects so you can do them alongside your kids too. 1. Resurrection Eggs tutorial and free printable from Scissors Paper Stone This is a very simple tutorial – kids can practice their scissor skills to cut out the ovals from the free printable designed by Jasmine of Scissors Paper Stone, and you can even string the eggs together to make a bunting decoration! You can put your own messages on the paper eggs or print out the accompanying symbols and Bible verses to teach kids about Easter. There are also a ton of really simple tutorials for very pretty Easter decorations on Jasmine’s blog that you can do together with your kids! 2. Easter Bunny face painting from Sakura Hakura I really like this creatively done Easter bunny costume! The bunny ears are simple to make and the bunny face paint can be achieved with simple blusher, eye shadow or powder and eyebrow pencil – so you don’t have to rush out to the store to buy special face paint. 3. A brilliant list of Easter book recommendations and colouring pages from Princess Dana Diaries With the symbols of Easter – eggs, bunnies and chicks – plastered over every store window, kids may wonder what it all means. It’s worth checking out some of the books from the Princess Dana Diaries booklist – which are all available at any public library in Singapore! There are also some free colouring pages on there – great for keeping kids occupied if you’re planning an Easter party this weekend. 4. 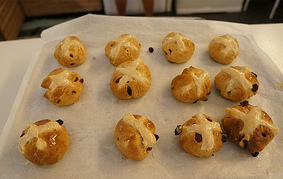 Hot Cross Buns from Olimomok Debra and her kids made those delicious looking hot cross buns together. They seem rather straightforward and easy to do – and I bet they taste REALLY good when smothered in butter and jam! 5. Upcycled Easter Bunny Tutorial from A Juggling Mom I have a soft spot for upcycling things around the house and turning them into fun toys for the kids and this craft is entirely made from bits and pieces around the house! I especially like the use of the shoebox – you can decorate the lid and then turn the whole lot into a portable playset. 6. Suncatcher Eggs from Life is in the Small Things This is a really quick and easy craft and is perfect for Easter Egg Hunt parties. This tutorial features little foam shapes and stickers on laminating paper, but I think it would work just as well with torn up coloured tissue, crepe paper or cellophane which would give a really pretty stained-glass effect! 7. Yarn egg garland from Mod Podge Rocks This particular craft uses regular 12″ balloons to make giant Easter eggs, but you can also made it using tiny water balloons filled with sweeties – pop the balloon afterwards and the sweeties will remain inside the yarn egg, making it a cute candy gift for kids. 8. Easter lily handprint bouquet from Artists Helping Children This is a very lovely paper and pipecleaner bouquet which kids can make themselves, using a rolled up handprint on plain white paper! I think it would be very pretty and meaningful as a Mother’s Day gift or even a Teacher’s Day gift! 10. Towel bunny from Glooshmoo I really like this cute little towel bunny – my 3 year old can make it too! Use a very thin, short pile face towel to make it easier for little fingers to manipulate. The tutorial calls for coloured push pins to make the eyes and nose, but I think you can get an even cuter effect with googly eyes or paper eyes stuck on with double sided tape – and you won’t run the risk of getting pricked in the fingers either. 11. Easter Bunny Bunting tutorial and free printable from Home Stories A to Z I like the idea of making this into an edible bunting with chocolate eggs. That would be just yummy. Just make sure you hang it in a cool area so that the eggs don’t melt! If chocolate eggs aren’t your thing, you can even replace the eggs with a fluffy cotton ball tail or turn the bunting into a ‘pin the tail on the bunny’ game for your Easter-themed party! 12. Cotton Ball Lamb from Spoonful This is a great one for preschoolers, using just cotton balls and a paper plate – simple and straightforward and it looks really cute too! Download the template from the link so that you can trace and cut out the sheep’s head and legs onto black or pink paper. 13. Clucking Rooster and Bunny from Willowday This is a really brilliant toy – which doubles as a rattle! Willowday even has a short tutorial video to show you how to put it all together. 14. Clothespin hatching egg from Dagmar*s Home The picture is pretty much self explantory! 15. Leaf print easter eggs from Inhabitots I really like these very pretty nature themed egg decorations! The edible dyes used to make these are all homemade from various vegetables and the recipe is included in the link. 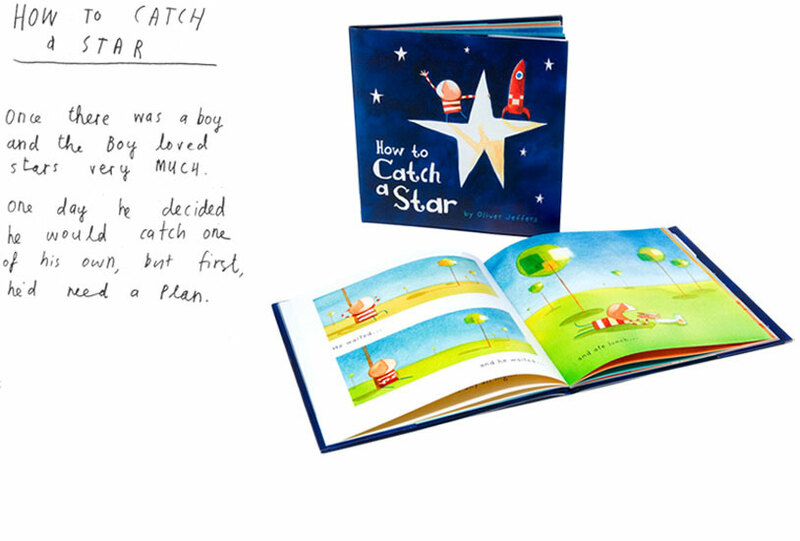 One of the very first books that I ever bought for J and Little E was ‘How to Catch a Star’ by Oliver Jeffers. Oliver Jeffers is an artist, raised in Ireland, who makes picture books (amongst other things) – and these pictures books are favourites here at Owls Well. We love his books for their deceptively simple illustrations, quirky humour and underlying themes of curiosity and discovery. Oliver Jeffers actually recently documented his trip to Bologna Children’s Book Fair, where he celebrated the 10th Anniversary of ‘How to Catch a Star’ with the release of a new edition which has some previously unpublished drawings in it! I am not surprised that the book has already become a classic. The story itself is simple and sweet, about a boy searching for a star of his very own and finding a friend. He tries several different methods to obtain his goal, and just when he is about to give up, he finds out that special treasures can be found in unexpected places. 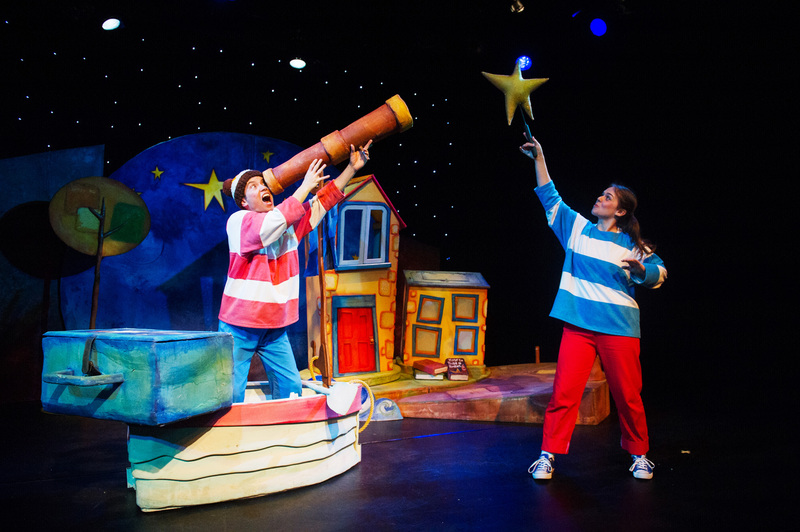 When J and Little E found out that their favourite book had been adapted into a stage play by Blunderbus Children’s Theatre UK, they were both really very excited! The flyer for the play, which has been brought to Singapore by ABA productions (who also organised KidsFest 2014), is still lying underneath J’s pillow, along with all his special treasures. I had the opportunity to conduct a brief interview with the lead actor, Benjamin Sbuttoni, and Simon Sanchez, the Blunderbus Outreach Co-ordinator. 1. What inspired you to choose this particular book to adapt into a play? ‘How to Catch a Star’, jumped out at us straight away. The story is funny, beautiful, and the little boy is a wonderful character who is determined to achieve his goal…to catch his star. The story gave us lots of ideas for what we could put on the stage. There are epic moments like travelling through space in his space rocket, and there are intimate moments like when the little boy is all alone with just his teddy bear for company. We look for a story which will engage children (and adults) on different levels and ‘Star’ does that and so much more. 2. What were the major challenges that you faced in translating ‘How to Catch a Star’ from page to stage, and how did you work around them? We see challenges as opportunities. Opportunities to be more imaginative, more creative, and push ourselves to create the best story we can. For example, in our show we use puppets, and if there is any a point that an actor can’t do something, then we get the puppet to do it. We find that by seeing every struggle as a possibility to excel, then we end up with a show that the children will love. 3. What message would you like children to take away at the end of the show? To never stop dreaming and one day you’ll reach the stars! The play opens next week, on the 24 April 2014 at SOTA’s Drama Theatre, and my whole family is going to be there! A Special Surprise for Owl’s Well Readers: ABA Productions is kindly sponsoring a giveaway of a Family Set of 4 top tier Category 1 tickets (worth SGD$248) to the Opening Performance of How to Catch a Star on Thursday April 24th at 5pm, right here on Owls Well! Huzzah! Update: Evelyn is our winner – thanks for playing!